CD Projekt's Summer Conference has revealed some exciting new details about The Witcher 3: Wild Hunt , including a release date, a massive collector's edition, and a very impressive gameplay trailer. We've known for awhile that The Witcher 3: Wild Hunt is coming in February of 2015, but now we know exactly when: February 24 is the day that the end of Geralt's story finally begins. 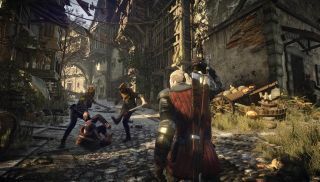 The game will launch simultaneously on the PC, PlayStation 4 and Xbox One, and GOG made a point of noting during its livestream that the content of all three versions will be exactly the same, offering more than 100 hours of gameplay in total. There will be some differences in the versions offered for sale, however. The standard retail edition will come with a good chunk of "premium" content, including a map, stickers, a Witcher universe compendium and soundtrack. But the collector's edition, much like its Witcher 2 predecessor, is the one that really impresses, with a large polystone statue of Geralt battling a griffin, a metal Witcher medallion, 200-page hardcover artbook and more, all jammed into a box big enough to hide a Volkswagen. Pre-orders for the collector's edition are live on the Witcher site . For gamers who don't care about physical trifles, the digital edition will include a digital version of the art book, a download code for the Witcher comic from Dark Horse and an extended soundtrack; purchasing from GOG will also net you avatars, concept art and a copy of the classic BioWare RPG Neverwinter Nights, as well as a "loyalty discount" for anyone who owns either or both of the previous Witcher games. On top of the preorder details, CD Projekt has also released a new trailer, featuring in-game footage. I may be biased—I'm a pretty big fan of The Witcher, after all—but I cannot wait to get my hands on this thing.